There’s no getting away from it – life is frantic. That’s why our holidays are so important. Over the years we’ve tried various different breaks from just sitting by a pool under the guaranteed sun of a Greek island (hot but a bit boring), to 2 weeks of full-on fun and activity in Orlando (exhausting and not a good time to discover you suffer from motion sickness!). What we did find out from these little experiments though was that none of them came close to our few precious weeks in Provence each year. It may sound a bit corny but the minute we arrive in the Vaucluse it feels as if we’ve slipped on a comfortable pair of shoes and been wrapped in a lavender-infused cashmere shawl – it’s instant relaxation and much more effective than any other remedy we’ve ever tried! The area is now so familiar to us that we don’t need maps to get from A to B and we have our favourite haunts that we have to visit each time we go (although the list gets longer each year). Just being there gives us the chance to slow down, recharge our batteries and enjoy being away from the simple day to day demands of family life at home and it’s probably the only time both my hubby & I genuinely feel that we get time just to sit and read a book. Most days include a cycle ride to one of the many beautiful villages where I can sit on a warm stone and just watch the world go by, from the incredible open views at Oppede Le Vieux or Saignon, where you can just pass time watching the shadows shift across the landscape…..
to the wonderful people-watching opportunities that come when sitting in a square of one of my favourite places on market day. 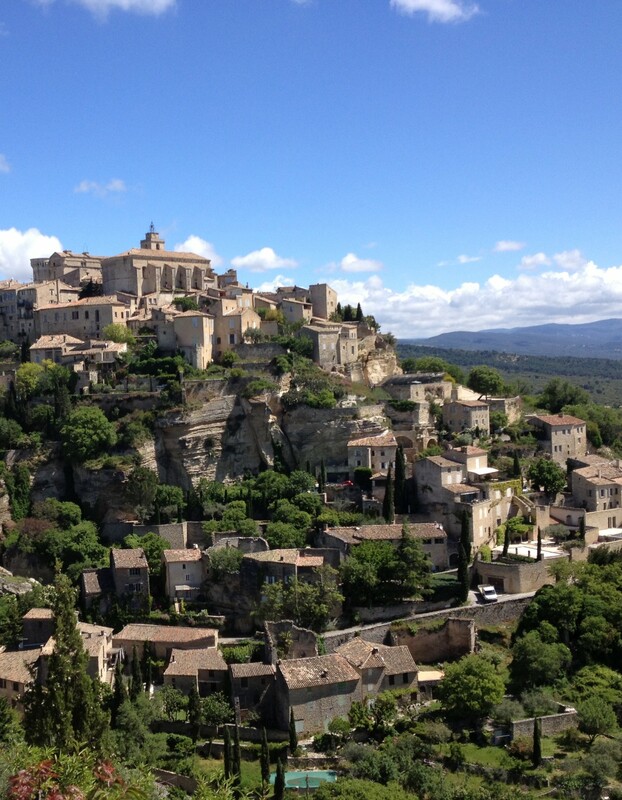 Last summer we were sitting at the viewpoint on the approach to Gordes, catching our breath after cycling up from Coustellet, when a tour bus turned up and the area was quickly full of people grabbing a quick photo, before piling back into the bus to be driven round to the carpark. Bizarrely one Japanese family grabbed my eldest son, who was rather befuddled when instead of asking him to take a photo of them, they pulled him into their family group and took a photo of him! Being a biased mother I know he’s a good-looking lad, but I still wonder why they needed that particular photo and where it now hangs. Once they had gone we stayed watching the view for a few minutes more before cycling round to the village and it seemed that almost as soon as we had parked and locked our bikes the visitors were already getting back into the bus to be driven on to their next destination. I can understand wanting to see as much of an area as possible in the time that you are there, but personally I need my holiday to pass at a snail’s pace so that I can immerse myself in an area and have a total break. Whilst I’m sure they’re having a lovely time, can they honestly say they have slowed down and relaxed – getting away from the rat-race?? – I’m not too sure……….